This is a very interesting and intense CD. The band features 8 members and this is the bands third release that I can see. This music is very tribal in nature with intense percussion and didgeridoo playing. Trance-dig-bass and percussion is how it is described. The players are quite amazing on this stuff. The band has a unique way of using samples and didgeridoo (with cool effects and echos). I have never heard anything like this but with a cool light show this could be pretty mind blowing stuff live. 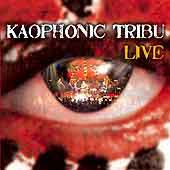 For more information you can vist the Kaophonic Tribu web site at: http://www.kaophonictribu.com.